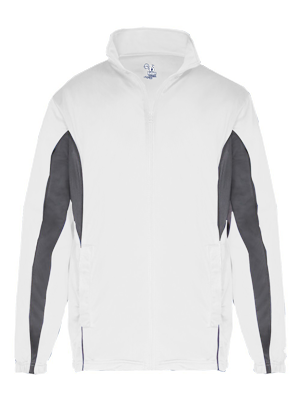 - Badger Adult Drive jacket. - 100% Brushed tricot polyester. - Front and back contrast inserts with piping, Open bottom with bungee cord and toggles. - Two front pockets with headset openings, Covered elastic cuffs. - Embroidered Badger logo on left sleeve.